The City of Elk Grove will host Party on the Palms, a new street festival for teens, this Saturday, September 17 from 3 to 9 pm in front of Elk Grove City Hall. 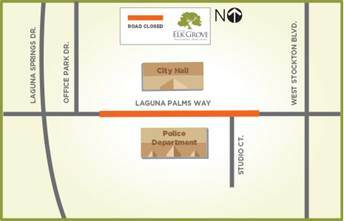 The event will prompt the temporary closure of Laguna Palms Way between Studio Court and Office Park Circle (See closure map below). A traffic plan has been created and the road closures will be in effect from 8:30 am Saturday to 9:30 am Sunday. Motorists travelling between Laguna Springs Drive and West Stockton Boulevard may use Red Fox Way or the north access for West Stockton Boulevard during the closure. Party on the Palms is a new event for teens to mingle, celebrate, and socialize in a safe environment. Activities will include music from KSFM’s DJ Alazzawi, a “teen scene” social media lounge with a photo booth, charging station, game truck, mechanical surf machine, coconut climbing wall and interactive games. This party is only for students ages 13-18 with a valid school ID. For event details, please visit www.elkgrovecity.org. For questions or concerns before or during the event, please contact the City’s Public Affairs Manager, Kristyn Nelson at (916) 477-0712 or knelson@elkgrovecity.org.